director of the Theatre Institute in Warsaw (Poland). She graduated from the Theatre Academy in Warsaw in 1985. Since 1995, she has edited the major Polish theatre journal Dialog. As a documentation specialist, she has cooperated with the Institute of Art of the Polish Academy of Science and the British and Commonwealth Studies Department in Łódź. She leads the team at the Polish Academy of Science, which works on the Internet dictionary of drama staged in Poland since 1989. She is editor of books and coordinates work on the Theatre Institute portal www.e-teatr.pl and the electronic Polish Theatre Encyclopedia at www.encyklopediateatru.pl. 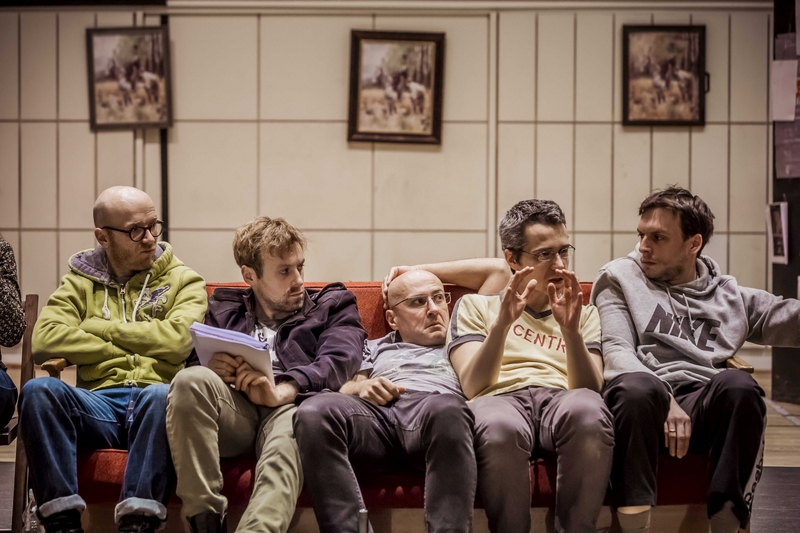 Friedrich Schiller's THE ROBBERS IN REHEARSAL, directed by Michał Zadara, premiere: 8.05.2014, National Theatre in Warsaw. Photographer: Krzysztof Bieliński/National Theatre Art. Archive. Publicly funded theatres in Poland should be protected. A lack of object knowledge and inadequate awareness of historical processes among public officials; a lack of a coherent, nationwide policy on matters relating to theatre; non-consensual institutional critique and the pressure exerted on publicly funded theatre from many directions – are all obstacles to thinking about the artistic institution as a beneficial and necessary thing. If points of view do not change and a co-operative approach is not adopted, the political, exclusive and mercantile interests of theatre ‘players’ may soon bring about the profound destruction of Poland’s system of subsidized theatres, still in existence today. Infighting and lack of co-operation weaken theatre, which operates across three sectors of the economy (the public, the private and the non-governmental sector). It’s astonishing how little effort it takes to persuade those working in theatre that, whenever the authorities take any action relevant to the arts, economics must invariably be the deciding factor. Foundations, associations and private theatres are unable to register the facts and accept that their development and improvement is directly proportionate to the condition of public artistic institutions. Publicly funded theatres, for their part, should not succumb to pressure, but fight instead for their position of institutions that provide models and set quality standards – from artistic quality to quality of management and of respecting workers’ rights, to the struggle to increase the arts’ share in the local budget. Public theatres1 and other artistic institutions are Poland’s common good, and there is no question they should be protected. It is equally unquestionable that everyone should have the right to access artistic works produced by these institutions. Anyone failing to comprehend this works to the detriment of the arts and to the detriment of the community producing particular artworks. What should and must be subject to debate is the form and scope of protection, nothing more. By arguing thus, I am not committing a crime – but I certainly risk clashing with advocates of indiscriminate institutional critique, with economic liberals and private entrepreneurs. Major obstacles in thinking about public theatre in Poland today include the ignorance of theatre matters and the inadequate awareness of historical processes that is common among public officials; a lack of a coherent nationwide policy on matters relating to theatre; non-consensual institutional critique; and pressure exerted from all directions on public theatre – indeed, on any publicly funded artistic institution – as a good, beneficial and necessary thing.2 If points of view do not change and if a co-operative approach is not adopted, the political, mercantile and exclusive interests within the complex, many-hued world of theatre ‘players’ may well bring about the destruction of Poland’s system of subsidised theatres, which still remains in existence today. That destruction may prove so profound, in fact, that the ‘actors’ now taking part in this ‘game’ may be startled to discover the object of their desires has collapsed. For it is not an objective estimate of what benefits society but a desire to possess institutions, to seize them – a desire often disguised by rhetoric praising responsibility, mission, democratisation, social control, transparency in disbursing public money, etc. – that motivates on one hand the ‘fratricidal’ combat in which working theatre artists lose blood, and on the other arrogant ‘play-it-safe’ attitudes among officials. The result is that provisions of the Organization of Arts Institutions and Working in the Arts Act concerning artistic institutional a u t o n o m y – guaranteed by designated subsidy – are misdefined and misapplied. In the aftermath of this infighting and lack of co-operation, each sector of the economy was weakened (theatres operate in the first, second and third sectors), and it took very little effort to persuade those working in theatre that whenever the authorities take any action that has an impact on arts organizations, economics must invariably be the deciding factor. I’m astonished at the efficiency of ‘soft’ instruments of pressure, causing institutions to set in motion an irrational system of self-limitation instead of lobbying effectively for increased subsidies – why would one meekly settle for less than the full amount one is entitled to? I struggle to comprehend how foundations, associations and private theatres are unable to register the facts then accept that their development and improvement depends on – indeed, is in direct proportion to – the condition of the public theatres on which all these other entities freely rely. Why are people so reluctant to defend institutions whose task should be to provide models and set quality standards from artistic quality, quality of management and of respecting workers’ rights to the struggle to increase the share of the arts in the local budget? Who sets spending limits? Public officials and city councillors. But all interested parties have or ought to have their say in the matter. The law doesn’t require the closing of an old theatre so a new one can be founded in its place. The law enables arts funding in its varied manifestations, and the setting up of new institutions that can and should cater to the diverse, ever-growing needs of artists and their audiences. Simply put, we must come together and be efficient in our fight for more. I believe it’s still possible to defend and uphold the system of institutional public theatre in Poland – and not as a bastion of reactionary conservatism, a post-communist relic or the preservation of a ‘stale’ status quo (and what ‘status quo’ could that be if nothing’s really stayed the same since 1989?). Instead, institutional theatre must be viewed as a thing of value whose existence and influence is now and may continue to be a boon to the entire system of which culture is part. In my view, the system of subsidized public institutions – above all, the artistic institutions of theatres and concert halls – must be defended at any cost. This is the takeaway not only from our history – though history teaches that, too! and ought we not learn? – but also from knowledge drawn from the experiences of other countries in which attempts to preserve the system of subsidized institutions has failed. When it comes to our perception of theatres, I encourage a change of perspective along such lines, and I fear that if the perspective doesn’t change, in our critical zeal we’ll miss the point when what can still be preserved as a community-enhancing instrument and as an inheritance that’s a source of hope rather than a burden will have been irreparably lost. With awareness of processes, with historical knowledge and from the experience gained by others, this new perspective can be formulated. A model or a visualization enabling a symbolic, space-oriented take on things can be helpful when seeking to make a better case for the proposition or theory we wish to put forward. No type of model or metaphor is more commonly used across the sciences than that of theatre. The ‘Cartesian theatre’ allegory3 is at once the most utilized of these and the foundation for many later conceptions, particularly those related to perception and brainwork. The fact that theatre is positioned at the very centre of the perception process is such a sign of immense recognition for this human ‘invention’ that an indubitable place in the sphere of public resources would be theatre’s right – yes, its right! – if simply for that reason. I’d also like to make a reference to two theatre models which modify Descartes’ conception and may help readers understand why I believe defence of necessity, even at its most radical, should be applied when speaking in support of arts institutions. Both models are related to brainwork and the consciousness-building process. This is due to the fact that for a decision to be wise and responsible it has to be preceded by the acquisition of relevant knowledge – that is, the development of consciousness. Understanding the phenomenon of consciousness is no easy task, obviously: help from sociology, psychology, biology and quantum physics is needed to approach it. But scientist Alwyn Scott’s reasoning, based on the concept of a hierarchical structure of mind where ‘atoms give rise to molecules, neurons form the brain and individual consciousness leads to shared culture’4 owes much to theatre. Scott presents this way of organizing mental work in the form of a symbolic staircase where every step is necessary for creating the entire structure. If we transpose this metaphor to our reality, that of theatre, we see that this staircase – that is, theatre culture in Poland – was built by the history of public institutions. This is not the place for recounting that history in detail – though since 2015 we’ve refreshed our memory of two hundred and fifty years of that process, initiated by a conscious gesture on King Stanisław August Poniatowski’s part, when he called into being the institution of public theatre. To some scholars, knowledge and awareness of how public arts institutions were established and how they’ve operated isn’t grounds today for funding them from the public budget.5 Nor are such grounds provided by these institutions’ historic past or bygone merit. Nevertheless, the historic considerations can’t simply be disregarded. After all, institutions – inaugurated in large part at grassroots level by citizens and local authorities – didn’t stop at some ‘phase one’ of evolution. As political and economic circumstances changed, they too, underwent transformations. If the eye of the beholder places its transfocator at the correct angle, however, it should recognise that over the course of that long process institutions have worked hard and earned a strong, prominent position for themselves by not letting their support from public funds be questioned. They refused to let those in power relegate them into the sphere of purely economic mechanisms and preserved their autonomy – both in theory and in recent enhancements including in the latest amendment to the Organization of Arts Institutions and Working in the Arts Act.6 Public theatres, ever at the disposal of different, changing artists and ensembles, still guarantee creative freedom and professional, social and human security. The arts institution, subsidized by public funding, provides the basis for maintaining Polish theatre’s high standing when compared with other arts – a standing acquired over many years of effort. Theatre has various obligations, which is precisely why it should also enjoy a variety of privileges, to ensure that those obligations can be met. Despite those who criticize the way theatre is organized in Poland, the number of theatres we have isn’t excessive.7 A hundred and twenty may be an impressive figure, but a total of fifty thousand seats in all public theatres isn’t much at all: we have medium-sized and small auditoria. However, if we multiply fifty thousand by the days in the year, we’ll see that the striking scope of public theatre is quite broad. This is a great asset of public theatre and must be protected: theatre must be able to work uninterrupted to create valuable, original impact in varied locations, as it often happens that values theatre conveys are attuned to (very) local needs. The consciousness-building metaphor proposed by physicist Erich Harth is apt in illustrating the position of public theatre, understood in these terms. According to Harth, theatre is part of the self-referent model he had proposed: the observer analysing action unfolding on stage. However, Harth argues, what distinguishes his model from previous attempts at solving the problem of the birth of consciousness is that, rather than placing theatre at the highest level of brain activity, the model puts the unification in one place, at the bottom rather than the top of the sensory pyramid. During this early phase, information held by sensors has yet to be processed and retains spatial interdependencies from the original stage. It’s at the bottom of the pyramid that all sensory indications and brain impressions are busy deciding how to paint the stage. There, too, is the observer: the remaining parts of the brain looking down and, to an extent, taking part in the work. Harth adds that consciousness emerging as a result of this self-referent process unifies information received directly by the senses and also binds everything that surrounds us: past, present future.8 Theatre works the same way. Consciousness, then, is key. Awareness and self-awareness act as brakes, precautions against transplanting models from elsewhere unthinkingly. Those models might work well in a different set of circumstances historically, politically and economically, and may even look better than those we have at home, but won’t prove so when transposed mechanically. An overview of such systems is found in the volume System organizacji teatrów w Europie [Theatre Organization System in Europe], edited by Karolina Prykowska.9 Authors argue that each country developed the system its own way, in response to and in recognition of needs of local society. Some solutions may be inspirations for future reinforcement of arts institutions in Poland, but no model can be transferred one-to-one into our reality. For theatre, being aware of its tradition and past is very important – not least in its institutional aspect – but doesn’t have to be (and indeed is not) synonymous with any hands-off or museum-like quality. In our self-referent model, tradition has the status of an equal ‘player’ in theatre. Anthropologists Agata Bachórz and Lesław Michałowski argue that ‘in the modern context, tradition is no longer something obvious, given, ready-made and taken for granted; instead, it becomes the consciously acquired property of a given community, and may be designed, subject to negotiations, intentional modifications and different transformations to a variety of ends.’10 This way of thinking has been present in theatre since time immemorial. Waldemar Kuligowski is as apt in describing this phenomenon when he argues that ‘tradition must not be left to its own devices: it should be cared and fought for. It is there to be proud of, at times even adored’.11 This is nothing less than one obligation of public theatre: an obligation it also needs to face in its institutional aspect. Public theatre is our tradition. In neurobiologist Bernard Baars’ cognitive theory of consciousness, which also resorts to the metaphor of theatre, contexts are ‘the backstage’. In Baars’ efforts to illustrate the concept of Global Workspace, which enables highly specialist information-handling processors to operate, he talks about the stage, and about ‘spotlight of attention’ actors who enter, exit and engage in dialogue. Director, stage designer and audience have been assigned appropriate roles, once again disputing and departing from ‘Cartesian theatre’. I shall reverse that metaphor as I endeavour to describe the idea that brought theatre-world representatives together in October 2015, at the European Solidarity Centre in Gdańsk. In Poland, 2015 had been a year of evaluating and taking stock of the social and cultural ‘project’ of public theatre, and of its two hundred and fifty years of history here. No less significantly, the year gave us the opportunity to assess the first three years of the amended Organization of Arts Institutions and Working in the Arts Act.12 One conference panel at the European Solidarity Centre, on the initiative of the Theatre Institute in Warsaw, the Ministry of Culture and National Heritage and the ‘Theatre Belongs to Us’ association, managed to encapsulate the results of that historical overview in the form of several diagnoses and recommendations. More than fifty people bringing all sorts of perspectives to the table – local and national, the interests of trade unions and associations, the economy and social sciences, theatre studies, NGOs, etc. – were of the mind that the organizational and funding system of public theatre in Poland,, though ‘inherited’ as it were from the previous political system, is a common good and cannot be squandered, for all its shortcomings and limitations. It was agreed that the system must be supported and that, at the same time, legislative solutions strengthening its autonomy and opening opportunities for acting outside the box must be arrived at. No arguments were found to support the claim that the existence of a hundred and twenty public theatres and six hundred other theatre ‘systems’ operating on another legal basis was a danger and a threat. The view was far more prevalent that theatres operating in various sectors of the economy are interdependent and should take joint action to mount a better, more efficient and more sensible campaign for legal regulations granting stability to institutions and organizations and more substantial budgets for the arts, above all. The panel also agreed that proposed changes should be worked out at grassroots level before being presented to the authorities for implementation. Arriving at this consensus was not easy: ‘interested parties’ in theatre are extremely diverse and focused in their own often contradictory needs. Lack of trust and a tendency to belittle one another had been the greatest obstacle to drawing up a plan for working together. The ‘backyard’ of theatre is barricaded and fighting goes on where negotiations should be taking place and where coalitions need to be formed. One faction refuses to accept the artistic ‘taste’ prevalent in repertory theatres; another takes the view that institutions are over-privileged when compared with other entities (associations and foundations) in the theatre field; another demands that their activities be granted an institutional form – that is, equal access to public funding – on the grounds of carrying out the same ‘mission’. Nevertheless, a common plan of action was formulated, and a work group selected from among those present. The group got to work, in keeping with a three-step plan. First putting together a list of good practices to be implemented by local authorities and theatres, with immediate effect. Then drafting advisable changes to the Ministry of Culture’s directive regarding theatres. Then finding whether the first two steps were sufficient or if work on special ‘theatre legislation’ should be undertaken, for the set goals to be attained. Crucially, work on any such legislation must be the result of a compromise worked out by all interested parties. 1. The Organizer issues a document calling into being an arts organization, in which are stated the organization’s objective, name and registered office. In addition, the document specifies whether the organization in question is an artistic institution as defined in Clause 2. An arts organization working in more than one organizational model listed in Article 2 may also be established. In addition, the act specifies the (three) ways of appointing the manager of such an institution, and describes the procedure for selecting a (nine-strong) recruitment panel. Among other things, the act states that an institution can be run (or co-run) by different organizers; individuals can work at such an institution on ‘flexible’ terms; an institution single-handedly administers the resources it has been assigned or has acquired, in keeping with the principles of effective use of such resources. 3) designated – towards the completion of specific tasks and programmes. The act specifies that organizers may reach an agreement in order to establish or manage an entity together – and that they can entrust management of that entity to a legal or natural person. The law is thus very open when it comes to how public arts organizations operate – this includes organizations with an artistic profile, which are further set apart in the act. The law sets no limit on the quantity of these institutions, or their size – nor does it specify what forms of art are allowed to develop as part of the organizations’ structure. Indeed, the law encourages the setting up of new organizations alongside existing ones. For existing institutions, the openness of the law is the first and basic argument in their refusal to be undermined, have subsidies cut or their status diminished. This argument also helps the entire world of theatre in not caving in to the view that resources must be taken from one organization so another can receive them: that one organization must close so another can be established. Lobbying for theatre in governmental offices and educating local authorities (in charge of most organizations) needs to be about a change of direction. After all, the task of organizing and maintaining arts institutions is not a punishment meted out by the central authorities, it’s a privilege and a rational investment in the regional brand and in the electorate: citizens, the locals. A recently completed pilot economic study commissioned by the Theatre Institute in Warsaw has revealed that 1 zloty (around 0.25 euro) of subsidy money generates an average economic profit of 3.36 zlotys (0.84 euro)14 for a region where such an organization is in permanent operation. Local authorities, therefore, can scarcely regard an arts institution’s upkeep as a loss or a burden on their budget. It’s an investment in which many fields are involved and from which many fields benefit. The work group held several meetings in 2016. Having analysed regulations of the act to which doubt lingered, group members went on to draw up a Good Practices list for selecting and appointing a theatre’s managing director. They also drafted a model contract entered into between a chosen candidate and the organizer of the competition. The two documents gather, in a more precise and complete form, guidelines set out earlier by trade unions and the ministry. Both put great emphasis on the ‘open’ possibilities of implementing solutions that are already part of the legislation, which, for reasons unknown, have not been put to use. Above all, time allocated for taking the decision to replace the managing director is of utmost importance for an arts institution to operate in a rational and meaningful way. What’s also crucial is that this should be an informed decision based on a proper and solid assessment, made not just with quantitative-economic considerations but also with qualitative-artistic ones in mind. In our Global Workspace at the Theatre Institute, we’ve held talks with representatives of municipal and provincial authorities who are in charge of 99 per cent of arts institutions in Poland. Individual legislative regulations and information contained in the Good Practice catalogue were discussed and debated during those talks. The meetings’ aim was to bolster local authorities so they aren’t afraid to utilize solutions likely to yield the best results, making the most sense for their institution, to turn to experts, and different non-economic ways of evaluating how theatres work. Also, much of the conversation focused on history education: very few local officials are aware of why, after 1989, theatres were put under the administration of local authorities. There’s still a glimmer of hope that the Theatre Institute and the work group, representing the theatre world, can become a global workspace where multi-lateral talks and debates will be held uninterruptedly, yielding results arrived at by participants over the course of discussions, for the benefit of all. The work group is divided into two sections, with one working on issues concerning public institutions and with the other focused on organizations in the third sector: independent companies, foundations and associations. It was on the initiative of the second section that Federacja Teatrów Niezależnych [Independent Theatre Federation] was established in March 2016. Its task is to enable more efficient lobbying efforts for legislative solutions granting greater stability to NGOs and to their work. As we make our preparations for Public Theatre Day, we endeavour to raise awareness among theatre professionals – managers, ensembles, audiences – and work also to improve relation between theatres and their organizers, attempting to empower all concerned. The aim of the nationwide action, in which all public theatres take part, is to reveal and keep exposing to public view the existence of a network of subsidized theatres, their activities in local areas and their meaning for the arts, which transcends the local. Their significance, that is to say. Polish commemorations of public theatre in 2015 have enabled us to summarize not only two hundred and fifty historical years, but also the past twenty-five years: political transformations were the turning point, putting theatre in a new situation. The network of state-owned theatres in operation during Communist times was decentralized then placed in the charge of local authorities.16 Still, it’s remained a network, despite cracks and ruptures discernible after a quarter century’s hindsight. The annual overview Theatre in Poland, published by the Theatre Institute since 2010, is one of the instruments for analysing the condition of public theatre in Poland. Along with conventional calendar-style documentation, the publication includes season-by-season analyses of results attained by those working in theatre. What do these nationwide statistics show? Theatre appears to be thriving: most indexes are on the increase. After the political transformation in 1989, theatres been not only been preserved but their numbers are increasing: new public organizations have come into being, and foundations, associations and private theatre companies are also numerous. Overall audience numbers are on the rise, as are the number of productions and supporting events. Mobility begins to play a role. The total amount comprising the budgets of public theatres is increasing, too. But statistics offer the opportunity to draw comparisons – and for their part they reveal micro-shifts and tendencies that are invisible at first glance but, over the longer run, have strong bearing on the direction of changes undergone by public theatre in Poland. What changes most of all are employment and budget structure. Although nominally the amounts of subsidies are similar or even marginally higher, that fundamental privilege of public theatre is making up an ever-smaller percentage of a theatre’s budget, compelling theatres to earn the outstanding amount ‘on the side’ by increasing ticket prices, securing sponsors, acquiring additional ‘designated’ funds, or opting for lighter repertoire likely to be more popular with audiences. Over twenty-five years, as theatres have sought to adjust to the market economy, ensembles have shrunk by approximately half: for example, in 1990 the Stary Theatre in Kraków employed ninety full-time actors, and the Powszechny Theatre in Warsaw had fifty. In the 2016/2017 season, those numbers stand at forty-five and twenty-five, respectively. Managerial and administrative departments are expanding, and previously unknown jobs and functions are being established. Actors rotate between ensembles, and newly established public theatres (including the Municipal Theatre in Leszno, the Kujawy-Pomerania Musical Theatre in Toruń, the Variete in Kraków) don’t have permanent ensembles. For the most part, members of each theatre-related profession remain outside institutions, forming independent companies or ensembles instead, or working for one of numerous private impresarios who produce touring shows. The majority of those professionals would rather work at an institution; there they’d be provided with social security, a more comfortable working environment, professional growth and an ambitious, questing repertoire. The growing number of festivals is evidence of major shifts in municipal budgets. Local authorities would rather fund events than daily work at an institution. This forces theatres into competing for funds, turning them increasingly into commercial, profit-oriented ventures. Designated subsidies are subject-based and reflect the taste of local officials, favouring entertainment, musical and family productions, and education in the traditional sense of the term.>Much can be inferred from these statistics. Another Theatre Institute publication, issued jointly with the Konfrontacje Teatralne festival in Lublin, is the Polish translation of Resetting the Stage: Public Theatre Between the Market and Democracy by Dragan Klaic (2013, Polish edition 2014). Klaic shows that this wave of American thought has nevertheless reached Europe. He describes the state of institutional theatre in the wake of the 2008 financial crisis in a penetrating, poignant manner. Given those circumstances, it’s been too easy to shed responsibility for public arts institutions (theatres), to force all kinds of ‘rationalizations’ on them (cutting subsidies, closings, mergers, assigning extra tasks for which – lo and behold! – money is somehow found). Festivalization, co-productions, shrinking the size of ensembles, reorganization – all were announced to be ‘for the time being’, ‘to get by’, then, per usual in these circumstances, nothing was restored to its original state. The fate of arts institutions to the west of Warsaw should be studied and analysed by all who work in and on theatre in Poland. I say all because, as we can already see, decisions made on a short-term basis have long-term implications and are capable of radically changing the picture. ‘The stage’ should be ‘reset’ not for the sake of change alone – instead, it should be the result of consciously recognising the need for and the point of transformation. Those who favour radical shifts wave a banner bearing a quotation from Klaic, in which he argues ‘against an automatic entitlement to public subsidy on the part of performing arts organizations, just because they claim a high artistic quality or a venerable history’.18 Politically correct public officials cite the argument that ‘public subsidies should be allocated on the basis of firm criteria that go beyond artistic excellence, in a tough but fair competition’.19 The argument in the back yard goes on. This baffling and astounding recommendation must be read as an attempt to restrict the autonomy of publicly funded arts institutions. Other bizarre views included in the document – that institutions take up the bulk of the budget therefore they are ‘ailing’; that theatres that are ‘financially sound’ ought to be freed from the ‘yoke’ of the public-administration structure and become companies;21 that the less funding managers receive, the more creativity they demonstrate in pursuing it,22 etc. – are straightforward recommendations that theatres become commercial ventures, all under catchy rhetoric about ‘rationalizing’ costs and management.23 What ‘economists specialising in the arts’ recommend to Warsaw City Hall is an evolutionary but, in fact, absolute makeover of the system: gradually dispensing with permanent ensembles to free artists into ‘the market’ and a departure from the repertory-based system. Their diagnosis is fatuous as nothing was actually studied in the authors’ study – certainly not the institutions’ genuine creative potential, which is the result of their autonomy. Instead, efforts were made to prove the initial thesis that subsidizing public theatres is a burden to the budget rather than an investment in the city’s development and local culture. According to the authors of the Diagnosis, advertising-agency staffs renting rooms from theatres have greater creative potential that artists working in theatre. What are the implications of such a diagnosis? The fact that we can climb stairs safely and with little effort is due to proprioception – the sense which enables us to remain aware of how body parts are positioned in relation to one another, without looking at them. Receptors for this sense, located in muscles, tendons and ligaments, provide the brain with information on muscle tension, vital for co-ordinating muscle work. When we climb stairs, our brain has to be briefed on whether the foot is already on the next step, whether it’s evenly placed and will provide support. Only then does the brain send a signal for the other leg to move. Uncoordinated movements bring about situations that are critical when it comes to safety and also ruinous to the process of consciousness. If we fall on the stairs, we may not be able to walk again. The politics of theatre24 is a complex system, and ‘the eye of the beholder’ needs to receive an integrated, proprioception-approved message on ‘how the body of theatre is situated’ so that body can make the next step, climb a step higher. As they engage in heated debates, those who practice institutional critique under all sorts of banners lose sight of these interdependencies. They lay the blame on the institution, holding it responsible for all systemic shortcomings – yet make no effort to come to the aid of institutions seeking to exercise their rights. After all, it’s people working in an institution that help shape its standing, stature and credibility. This is true of arts institutions in particular. Not many who went to see the final performances of Schiller’s Zbójcy [The Robbers], on 25 and 26 March 2017, at the National Theatre in Warsaw probably noticed words painted on one set wall. In the hideout of the highwaymen led by Francis von Moor (transposed into the present day), someone painted in red the motto: Centrala nas ocali. [HQ will save us.] ‘Regular’ audience members might’ve read the motto as a comic part of the production’s soap-opera conventions, and failed to decipher its subversive, manifesto-like nature. The bomb at the National Theatre thus failed to explode – still, it’s been planted. Colleagues planted it in their colleagues’ midst. Those in the audience probably know little about how theatres in Poland are organized – and probably don’t care much, though they may occasionally wonder at ticket prices. People caring most about the system are people working at theatres – and organizers, who disburse public money to them. Who was the motto meant for, then, placed on a wall long after the premiere, expressing at once a lack of faith in the power of public theatre as an institution and a deep conviction that a miraculous antidote has been devised? ‘HQ will save us’ – that sentence recurs in a 1982 song by the aptly named band Brygada Kryzys [Crisis Brigade]. Michał Zadara, who directed The Robbers, took the song as the anthem for his own ‘HQ’: Centrala, a private company / organization founded in 2013 in collaboration with the GAP arts agency, run by professor of economics Jerzy Hausner. Zadara has described Centrala as ‘a company working with public and private institutions to find flexible ways of taking advantage [my emphasis] of the resources different subjects have at their disposal in the process of creating art’. Centrala makes a profit, and produces art by taking advantage [my emphasis] of opportunities offered to and the rights held by theatre as an institution. But is its approach a genuine alternative to public theatre? Centrala wouldn’t have been able to produce Fantazy, a drama by Juliusz Słowacki, a leading Polish Romantic, or the entire script of Dziady [Forefathers’ Eve],Poland’s foremost Romantic drama, written by Adam Mickiewicz, or The Robbers – all of which productions were directed by Zadara. Similarly, it’s doubtful whether Centrala provides a real sense of professional and family security if actor-director Barbara Wysocka, co-owner of the company, opted for full-time employment with a public-theatre ensemble when she became pregnant. In this issue of Polish Theatre Journal, Kamila Paprocka takes a closer look at Centrala’s organizational form, thus I will not describe it here.25 Centrala operates because Polish law permits it – the fact is, however, that its work would be completely different were it not for numerous institutions working with it. To put it bluntly: like other theatre systems operating in the second and third sector of the economy, Centrala needs institutions. It doesn’t hide the fact that it falls back – or rather preys – on those institutions. Systemic change – even if and when it is worked out and agreed upon by the entire theatre world – entails a sweeping change of the ‘politics of theatre’, including social benefits and pensions, drama education and employment law. As matters stand now, Centrala and numerous other private theatre systems can only operate because institutions are in place that provide these ensembles and groups with support, resources and a point of reference. Having observed this mutual relationship for years, I feel entitled as part of defence of necessity to confess I don’t understand why the so-called private sector remains unaware of or unable to grasp the simple relationship: the better the condition of public theatre, the better the shape of the entire theatre system. Perhaps their sense of proprioception hasn’t been functioning properly. It’s a shame that such radical yet very reasonable statements are so few and far between today. The institution will save us, because it stands a good chance of setting standards and abiding by them. This is the duty of a public institution. The network of arts institutions – public theatres – creates a neuronal film necessary for the arts to function properly. This basic network may expand, it may receive information about new phenomena and new needs – and the system of proprioception will recognise that new data. In a properly functioning system featuring different kinds of tissue, the kinaesthetic system will be able both to maintain balance and see to it that the entire thing develops. Self-awareness is a crucial facet of awareness: if we don’t look after one another, we remain at the level of instinct and will not be able to climb stairs newly built in our theatre... If we trust our senses, we still have the chance to save public theatres and arts institutions as autonomous, independent places. Independent of changing governments and procedures, of the dictates of economic prosperity, of herd instincts that make us follow fashions and middlebrow tastes – and, indeed, of the indivisible rule of artists. The institution cares just as much for those who are at the receiving end of its work. A conscious audience member, educated by theatre that is independent in its organizational aspect, its thinking and its artistic freedom, will choose the right representatives, people who are fit to decide how to allocate public money. Let’s fight for budgets for the arts; let’s establish new institutions. The law enables this and encourages it. Let’s not cave in to organizational homogenization: institutions and project-based organizations have different tasks to fulfil, and one can’t be replaced by the other. What matters is that all these forms are able to operate alongside one another, and complement each other. This is what we should lobby for together. A grassroots, networked, self-referential model of building, rebuilding and expanding theatre consciousness – including collective consciousness – is no utopia. It is a necessity. 1. In Poland, theater institutions are financed from 60 per cent to 80 per cent by the state budget and budgets of local governments. 2. One example of this critical approach is ‘Nie ma się czego wstydzić’, a piece by Agnieszka Jakimiak, published online in the journal Dwutygodnik 173, November 2015, www.dwutygodnik.com [accessed on 1 June]. 3. Outlining his conception of dualism, Descartes argues that mind and body, the spiritual and the material, the external and the internal, all communicate with one another. Theatre is the meeting place for the factors in each dualism. The spectator, or homunculus, ‘traces’ the meeting in his mind and makes an informed decision based on stimuli received. 4. Alwyn Scott, Stairway to the Mind: The Controversial New Science of Consciousness (New York: Copernicus, 1995). 5. Dragan Klaic, Resetting the Stage: Public Theatre Between the Market and Democracy (Bristol, Chicago: Intellect, 2013),p. xi. 6. The amendment became law on 1 January 2012. 7. ‘Finansowanie teatrów jest skandaliczne’, Jagielloński 24, jagiellonski24.pl [accessed on 12 May 2017]. 8. Erich Harth, ‘Self-referent Mechanisms as the Neuronal Basis of Consciousness,’ in Toward a Science of Consciousness: The First Tucson Discussions and Debates, eds. Stuart R. Hameroff, Alfred W. Kaszniak, Alwyn C. Scott (London, Cambridge, Mass. : MIT Press, 1996), p. 628. See Scott, Stairway to the Mind. 9. System organizacji teatrów w Europie, ed. Karolina Prykowska (Warsaw: Instytut Teatralny im. Zbigniewa Raszewskiego, 2016). 10. Agata Bachórz, Lesław Michałowski, ‘Gdzie bije prawdziwe serce Kaszub? Przypadek dyskursu o nieuprawnionej tradycjonalizacji’, in Kreacje i nostalgie. Antropologiczne spojrzenie na tradycje w nowoczesnych kontekstach, eds. Grażyna Woroniecka, Cezary Obracht-Prondzyński, Dorota Rancew-Sikora (Gdańsk: Polskie Towarzystwo Socjologiczne, 2009), pp. 326–342. 11. Waldemar Kuligowski, Antropologia współczesności (Kraków: Universitas, 2007), p. 80. 12. The 31 August 2011 Amendment to the Organization of Arts Institutions and Working in the Arts Act and to selected other acts, Dziennik Ustaw [Polish Journal of Legislation] 2011, No. 207, Item 1230. 13. These are not the only organizational forms that can be taken by creative activity in the arts: the catalogue of such forms, included in Article 11, Paragraph 2, is but a list of examples. 14. The study was founded on the assumption that institutional impact on the socio-economic system comes in two stages. First, the immediate effect measured by income derived from tourist movement generated by the theatre in the region and theatre expenditure (staff pay and employment costs; insurance and other benefits; purchase of external services; use of energy and materials; taxes and fees). The second stage is the induced effect, estimated with the help of an index constructed on the basis of the so-called Keynesian multiplier – taking into account, for instance, an increase in spending brought about by the region’s increased income, such as pay, that is the result of the work of entities in the creative industry. The study’s methodology has been drawn up by Prof. Rafał Kasprzak from SGH (the Warsaw School of Economics). 15. See Barbara Fatyga, Bogna Kietlińska, Publiczność 2016: My jesteśmy kulturalna kolejka, a nie żadne chamstwo. Raport (Warsaw: Instytut Teatralny im. Zbigniewa Raszewskiego, Fundacja Obserwatorium Żywej Kultury – Sieć Badawcza, 2016), www.encyklopediateatru.pl [accessed on 1 June 2017]. 16. 1990 to 1993 marked the beginning of the decentralization process. National theatres were set apart from the other theatres during that period, and attempts were being made to hand theatres over to municipal authorities (possibly a path-finding experiment). From 1993 to 1994 brought about the implementation of the so-called pilot programme: a greater number of theatres taken over by municipal councils, though they remained funded from the national budget, the only difference being that a municipal administration was now acting as an intermediary in the process. The 1999 administrative reform brought the final decentralization of theatres: three national theatres are supervised directly by the state and the rest – one hundred and twenty institutions – are placed in charge of provincial governors, city mayors and local authorities. 18. Klaic, Resetting the Stage: Public Theatre Between the Market and Democracy (Bristol: Intellect, 2013), p. xi. 19. Klaic, Resetting the Stage, p. xi. 20. Krzysztof Malczyk, Łukasz Maźnica, Jan Strycharz, Diagnoza potencjału podmiotów kultury w zakresie realizacji Programu Rozwoju Kultury 2020 (Kraków: Fundacja GAP, 2015), pp. 17, 20, 30–31. 24. The ‘politics of theatre’ was defined by Jan Kochanowicz, the actor, director and activist with the Polish Theatre Artists’ Union, as early as in the late 1920s. According to Kochanowicz, this type of politics comprises rules for employing actors, the organization of theatre life, the network of public theatres, education in drama, the mutual relationship between artist and patron, goals of the art of theatre in Poland (outlined in the most general terms), funding of theatres and all manner of regulations. 25. See Kamila Paprocka-Jasińska, 'Can Centrala Save Us?' in this issue. 26. This is addressed by Piotr Stasiowski (for example) in ‘Instytucja srucja’, Biuro #2: Marzyciele, 2.1 (2010), pp. 68–71. 27. 'Manifest Komitetu na Rzecz Radykalnych Zmian w Kulturze', warszawa.ngo.pl [accessed on 17 May 2017].